It's been a month since the end of Arsenal's season and Arsene Wenger has made just one signing in this time. Many though he would be busy in the month following the end of the domestic season signing up experienced players to join his squad ahead of the World Cup in South Africa. But the only man coming through the door at Highbury House to put pen to paper has been Marouane Chamakh, the player he missed out on signing last summer. With the veteran defenders William Gallas, Mikael Silvestre and Sol Campbell all out of contract come the end of July, it gives the manager a chance to build a defence for the next ten years if he wants to. I would expect Gallas to leave. He's been given ample opportunity to sign a new deal with the club and has failed to take the opportunity to put pen to paper. It's a shame because I feel he probably has two good seasons left in him and his partnership with Vermaelen in their first season together was one of the positives of the last campaign. Silvestre, an honest professional, will no doubt move on. He has been fine in reserve but you can't see him play week-in-week-out at the highest level for Arsenal any more. Campbell, from what we have been told, has been offered a new deal. He will wait and see where he falls within the central defence pecking order before he commits himself to another 12 months with the club. I for one hope he does decide to stay. I would expect him to be fourth or fifth choice but he has the experience and winners mentality that our squad has been lacking. "The basic improvements that have to be made is defensive and with spending the right money. Philippe Senderos, another of our central defenders, left for Fulham yesterday. One of the players we have been linked heavily with is Laurent Koscielny of Lorient. He is a player who I know little about. He signed a contact with the French Ligue 1 club last summer on a four year contract in a 1.5 million euros deal with Tours FC where he had two season, appearing for the Ligue 2 side 67 times scoring six goals. He is 6'1" tall and has Polish roots. He has yet to decide which country, France or Poland, he may choose to represent at international level. I'd image if we are to sign him, he'll cost four to six times more than the 1.5 million euros Lorient paid for him. The departure or uncertainty of the majority of our central defenders presents Arsene Wenger with an opportunity to completely remould his defence. If Gallas, Silvestre and Campbell join Senderos in leaving the Grove, it would leave us with just Thomas Vermaelen and Johan Djourou as the only remaining recognised central defenders with any experience at the club. Vermaelen would certainly be first choice. 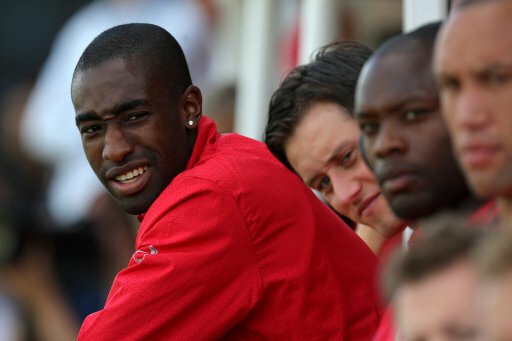 As for Djourou - he has yet to feature consistently since the 2008/9 season where he started 13 league games and before that the 2006/7 season where he made 18 league starts. He was injured for all but one game of the 2008/9 season and made a substitute appearance on the final league game of the season against Fulham last term. The Swiss defender has all the qualities to be a top player, but he need to be injury free. It will be interesting to see who Wenger brings in to supplement the two he has on long-term contracts. Whether he relents and offers Gallas a two-year deal, adding Campbell on a year-long contract and then brings a new face in to get used to Premier League life, could be the way to go. However, it would only be delaying the inevitable, which is that Arsenal's central defence needs new recruits and for me, that should be done sooner rather than later.